Soothe and nourish your baby’s delicate skin with the No.1 pediatrician recommended baby brand! 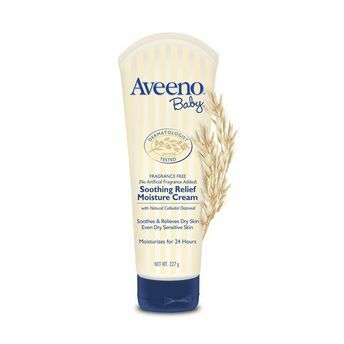 Aveeno Baby Soothing Relief Moisture Cream contains Active Natural Colloidal Oats Formula and rich emollients that soothe dry, irritable skin. It’s clinically proven to moisturize for 24 hours and soothe dry skin. As a skin protectant, active ingredient, oatmeal can help restore skin's normal pH and aid in the maintenance of skin's moisture barrier to help prevent and protect dry skin. This formula absorbs quickly and is gentle enough new-born’s delicate skin as well. It’s hypoallergenic and fragrance free.